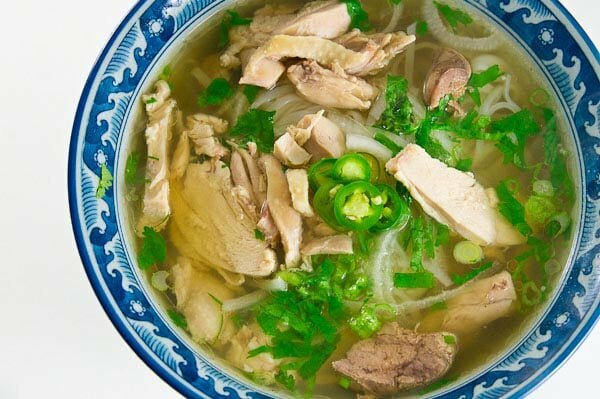 Phở Gà, or chicken pho is the Vietnamese version of Chicken Noodle Soup. With a light clean chicken broth and flat rice noodles it's soothing comfort food at it's best. Making great chicken stock can be challenging. Boil it long enough to get lots of flavor in your stock and you end up with dry pasty chicken. Don’t cook it enough and you end up with a watery broth. It’s a trade-off that leads many to throw away the meat used to make the stock and then cook a separate batch of meat to serve with the soup separately. Given that one in seven people around the world are chronically hungry, this just seems gratuitously wasteful. It’s a concept that has a word associated with it in Japanese: mottainai (勿体無い), which roughly translates to “What a waste”. It’s something frequently uttered with disdain in Japanese households and I suspect other Asian cultures have a similar concept since it is rooted in Buddhism. One of the things I’ve always loved about Phở Gà is that it uses every part of the chicken, including the liver, heart, gizzards, etc. But it’s always bothered me how the meat tends to be dry since it’s boiled to make the soup. I’ve found a better way to make chicken stock that gets you a great broth, with tender moist chicken, that is perfectly cooked. The trick is to gently poach the whole chicken first. Then, after separating the meat from the bones, the bones go back into the pot until you have an intensely flavored broth. I use a similar method to make my chicken soup as well as my hainanese chicken rice. Since this is for Phở, I add aromatics like charred onion, garlic and ginger, but I go easy on the seasonings as chicken is easily overwhelmed by spices such as star anise and cloves. The charring not only develops new flavor compounds, but it also adds a wonderful smokiness to the soup that gives it depth. Normally I’m a big fan of adding condiments such as basil, bean sprouts hoisin and hot sauce to pho tai nam, but I prefer my phở gà northern style: with wider noodles and a minimum of garnishes. Perhaps it’s because the more delicate chicken broth is easily smothered, or maybe it’s because the first really great bowl of phở gà I had was Hà Nội style. Whatever the case, the only table-side condiment I serve my phở gà with is pickled green chilies. One last note. I like my noodles very al dente. Because rice noodles cook so quickly, by the time you boil, drain and add them to the soup, they’re soggy already. One way around this I’ve found is to skip the separate boiling entirely and to cook the noodles directly in the soup. This gets you perfectly cooked noodles every time. Wash the chicken inside and out, including any offal it comes with and set aside. 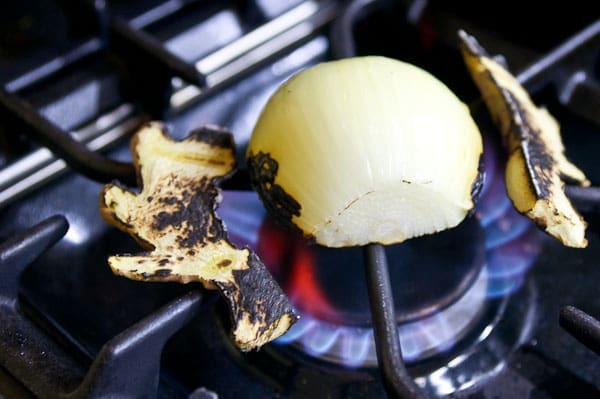 Using a broiler, torch, or a gas stove, burn the cut side of the onion, both sides of the ginger and both sides of the garlic. 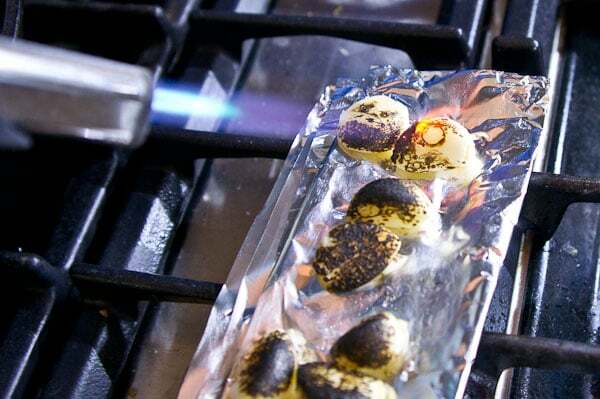 If you have some wire mesh you can set it on the gas stove for the garlic, otherwise a torch works great for these. You want the surface to be about 50% black as it adds a wonderful smoky flavor to the soup without making it bitter. Put the neck, gizzards, heart and liver inside the chicken. Place the chicken breast side up into a stock pot just a little larger than the chicken, then put all the other ingredients for the soup around the chicken. Add water until the top of the breast is almost covered. Cover with a lid and bring the water to a boil over high heat. When the water comes to a boil, turn the stove off (do not remove the lid), and poach the chicken for 40 minutes. Remove the chicken and set it aside to cool. When it's cool enough to handle, remove the offal from the cavity and set aside. Carve all the meat off the bones and return the bones to the stock. Simmer the stock for another 1 1/2 hours. Slice up the chicken meat and offal and put it in the fridge. Soak the dried banh pho noodles in warm water for about 30 minutes to rehyrdate them. Chop up your condiments and have them ready. Make the pickled chilies by adding the sliced chilies, vinegar and salt in a small bowl and setting aside. When your broth is done, strain it through a fine mesh sieve and skim off any excess oil. Taste the soup for salt and add more as necessary. Bring the stock to a boil. Drain the noodles and add them to the stock. The rehydrated noodles will cook in a matter of seconds, so a couple swishes is all it takes. Split the noodles between 4 bowls and top with the chicken, offal, onions, scallion and cilantro to taste, then ladle on the hot broth. Serve immediately with the pickled chilies. If you prefer a southern style Pho, you can also serve this with Vietnamese basil, bean sprouts, lime, hot sauce and hoisin sauce. my friend made Pho and it took her a day to make the stock. The broth was absolutely gooohd and was worth the wait. Thank you for sharing with us your techniques, I will surprise my friend that I could make a better Pho than her haha! Merry Christmas Marc! I always use the meat from my chicken stock. I like your approach here, and I think I’ll try something like this the next time I make samgyetang! Your soup looks great, and I even love the bowl it’s served in! What an innovative method for making it. So true about wastefulness.. but what a great way to introduce pho ga! I recently made pho bo for the first time, and I’ll have to try this next! Thanks for another great recipe! Have a great holiday, Marc! Pho is one of my all time favourite dishes from any cuisine in the world – thank you for posting what seems like a do-able, yet totally authentic recipe. Bookmarked. I have a feeling I will be needing some Asian flavours after two weeks in Mexico these holidays 😉 Wishing you much merriment, great food and fun times over the holidays! I’ve heard/read so much about this soup. My understanding there is nothing better when you are feeling ill or have a hangover! Great tip on the chicken stock! And the pho looks great, as usual. I love pho ga; I actually prefer it to regular pho bo, because the soup is usually sweeter and lighter and so comforting. This is a great recipe, and I can’t wait to make it. Love all of your tips almost as much as I love this soup. I am a huge chicken soup fan and true believer that it cures all ills. But I would much rather have it with all of these wonderful flavors than the traditional Jewish Penicillin! Fabulous recipe! I just made chicken soup last night (I have a cold) and was making the same reflections! In fact I hesitated before throwing away the bones, thinking I should reuse them; howeve, fatigue won over and I just got rid of the bones. Your technique is spot on and I will use it next time, as well as make this soup for the change of taste! (I always end up throwing rice in my chicken soup!). Japan, juk in Korea, congee in China). I love making pho from scratch (and charring the onions and ginger really do make a difference!) Thanks for the tip with the chicken stock, that’s always a dilemma I have. 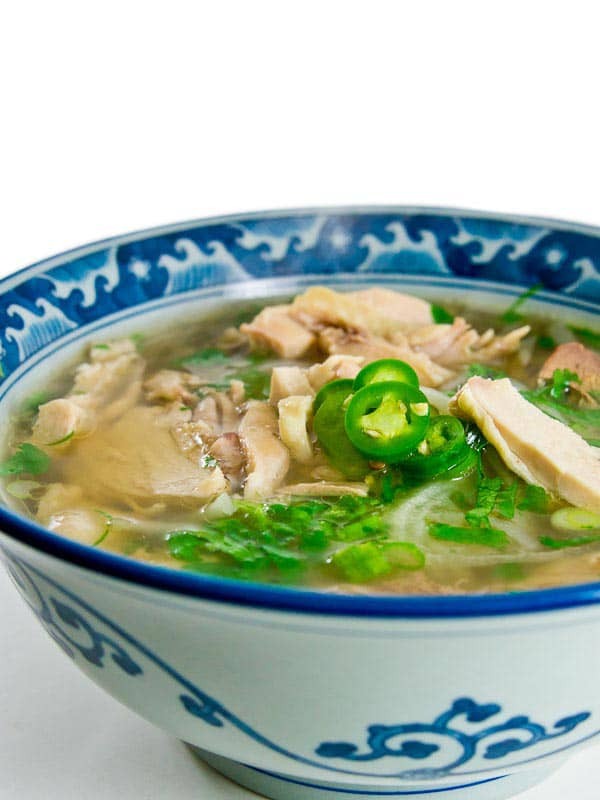 Is there anything better than Pho in the winter? We get it any time we’re feeling a cold come on… a big bowl of that and we’re as good as new. Great post, my friend! I am so excited to try this. Pho Ga has been on my soup list forever. Thanks! excellent! my biggest problems with chicken Pho in restaurants is that the chicken is either bland and tastless as you say, or the chicken has been cooked completely apart from the stock and sliced in big fat dry hunks of breast…terrible. question, in the secion where you soak the noodles in warm water, you then go on to say to bring a pot of water to a boil…but never quite mention that pot of water again…is it misplaced? adding the rehydrated noodles straight into the broth works better. Your technique of poaching the chicken first is really intriguing! As for the noodles, I simply place them in a mesh strainer and dip the entire thing into a pot of boiling water for a few moments, swirling the noodles about with chopsticks. It’s a trick my mom taught me, and I’ve never had overcooked noodles! I love homemade chicken stock but realized the same (tasty broth, dry, crumbly chicken, yerch). I usually make chicken stock from the bony pieces I collect over the weeks (I buy whole chickens and then cut them up) and add one chicken breast. I remove the breast as soon as it’s done but still tender and moist and then simmer the rest longer to get a rich, flavorful broth. Your recipe sounds marvelous. Thanks for the great tips. wow your pho ga looks amazing! I’ve tried vietnamese pho before but its beef and its very delicious. I’ve been wanting to make a pho for a while now and thank you for sharing this recipe, I think I’m going to make this, this year. After all of the holiday treats that have made their rounds, I am ready for some pho! Your Phở gà is truly amazing. I love the way you grill the onion and ginger, as well as your great understanding of cooking and enjoying Phở. The photos are very inspirational too. I’m from the North of Vietnam, and I think your Phở gà looks exactly as an authentic Northern style one, and it must taste wonderful. Just a minor thing, northern phở rarely has sugar in it. The soup with some sugar added is more like the southern style. Thanks for the lovely post that fills me with nostalgia!! thanks for sharing this awesome recipe! i made this pho ga recently and my brought turned out to look quite brown, rather than the light colored pho ga broths i’m used to. it looked and tasted more like a regular pho broth. is this because of the charred onions and ginger? brown too, so I’m not sure why that would happen. Did it taste okay? Hey great recipe!! Being the yuongest of 12(6girls and 6 boys), cooking was done by my mom and older sisters. Now that I am married and have 4 kids of my own, they love pho. Going out get expensive and we don’t live close to places that serves pho, so I end up learning to make pho bo. I gave up after several attempt. So now try cooking pho ga, first time….it’s great! Thank you and my kids will thank you too! Marc, your cooking technique is simply perfect! The chicken was tender and moist, the broth tasted very authentic. I added some cut up chayote and daikon to “amp” up the flavor of the broth even more. My pho ga broth came out a light brown color/clear brownish…I am wondering if it is because of the star anise and the Saigon cinnamon??? Eating this right now. Even did the pickled peppers. This is amazing the best I have ever had!!! Great recipe thank you!! I forgot one thing: No cinnamon in phở gà. Thanks for the tips! I’m going to try making it your way the next time.